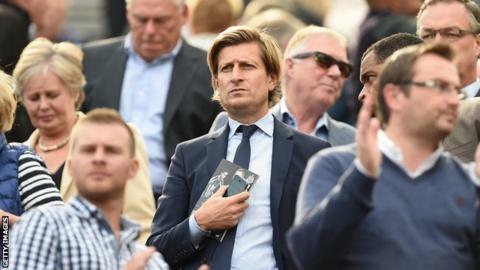 Crystal Palace co-chairman Steve Parish says he is open to a change of ownership at Selhurst Park, but has denied a takeover is imminent. Reports on Monday suggested that American billionaire Josh Harris was in talks to take control of the Premier League club, with a deal close. Parish told the Croydon Guardian: "We look at all possibilities that are out there - and there are many. "But people have been quite ahead of themselves on this one." Harris, a private equity investor, is the principal owner of two sports teams in the United States - National Hockey League side New Jersey Devils, and the Philadelphia 76ers of the National Basketball Association. He and business partner David Blitzer were linked with a takeover of Aston Villa during the summer. Parish has been co-owner and co-chairman of Palace since leading the CPFC 2010 consortium deal to save the club from extinction four years ago. He said: "We are talking to a number of people on a number of fronts. "I've always said that if somebody wanted to invest in the club and move it forward quicker than I or we can then we would entertain it." However, he also said: "There are always people who want to buy football clubs. "Sometimes people approach you and it gets out, sometimes people approach you and it doesn't, but there is no imminent takeover."